So I fired up OOTP 13 on the older and slower computer I have, a 2008 model running on Windows Vista, as my newer computer bit the dust and is on the stairway to computer heaven. Pleased to report that the game runs well even on the old, reliable Vista. I have this idea I use on my universes, thought I would share it. I call it the “Boy Genius GM” concept. It’s one of many concepts you can create in the game. Heck, if you want to run an American Baseball League filled with players from Thailand, you can do it. That is what’s so great about the OOTP series. If you can imagine it, you can probably do it, and if you can’t, there’s always the next version of the game that might make things easier. I pick a season as a starting point. And I make myself, the “Boy Genius GM” 20 years or so younger. I pick a team at random. Most recently, I started a new “Boy Genius” universe in 1971, the year I was actually born in, and drew the St. Louis Cardinals, with Bob Gibson, Lou Brock, and Joe Torre. What I do is watch the games go by super fast, let the in game manager do his things, and concentrate on trades, hires, and who to fire. One point on trading. If a trade puts you a good sized amount of money to the bad, don’t be afraid to ask your trading partner for money. For example: I picked up reliever Jim Brewer of the Los Angeles Dodgers to boost up my bullpen. But I noted that the trade would result in picking up $32,000. Playing around with what I should ask back for in terms of cash, I got $24,000 from LA to minimize the initial cost of the trade. And as a rule of thumb, you should try to ask the other team to help you recover 75% of your losses on the trade itself. Won’t help you in the long term salary wise, but picking up a few thou here and there stretches what you can spend. For all of you OOTP baseball fans out there, might be a good time to backup the league you’re working on. A programming patch (13.4) is scheduled to come out sometime today that fixes many bugs. The story so far, such as it is. 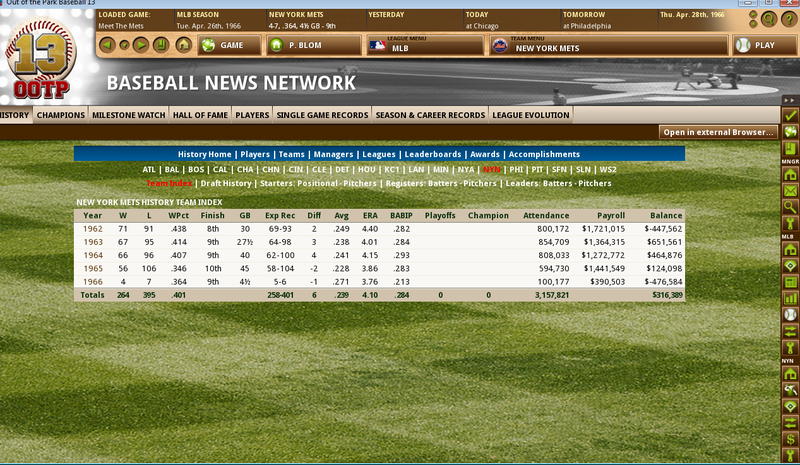 Beware of the consequences of running an expansion baseball franchise in OOTP 13. My main project is the expansion Mets of 1962. In real life, they won only 40 games in 1962. In my universe, they nearly doubled that, going 71-91. But it came with some steep prices. All the trades I made were without any care to the budget, which meant I could only spend frugally in the coming seasons. So my 71 win season in 1962 got followed by 67, 66, and 56 win seasons the next three years, which I speed-played. Not to mention the fans won’t come and see a losing team, so my team loses money whenever I have a home game, and makes money when we play on the road. Casey Stengel saw the writing on the wall and left in 1962. That was also the year in this alternate universe that Ralph Houk was fired by the Yankees as their skipper. So I spirited Houk cross town, but he only last a little over a season with the Mets. Some manager the game made up was the skipper in 1964-65, and he was even worse. Probably the biggest humiliation to date was getting no-hit by Sandy Koufax at Shea Stadium…on the opening day of 1965. So needless to say, changes had to be made. I think I might do this again in the future. It was a lot of fun to produce. A look at the OOTP Las Vegas 51s, the AAA farm team of the Blue Jays. June 2, 2012. During the week, I gained a new addiction, and it is called Out Of The Park Baseball. More specifically, the 13th version of OOTP, as fans refer to it as. This is not your father’s baseball video game, nor is it a PS3 or X-Box 360 game decided by good reflexes. Nor is it a game based on superior graphics. It is, basically, an interactive spreadsheet of baseball. What can you do with it? It’d probably be better to describe what you can NOT do with it. You can pilot any or even all of the 30 MLB teams, or even pilot a minor league team, one of my favorite things to do.